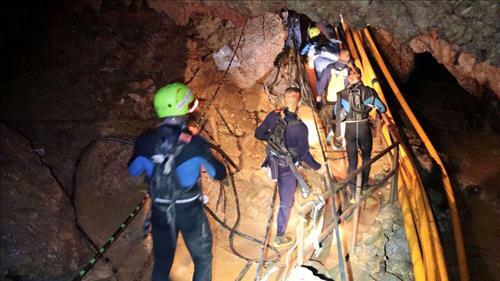 AMMONNEWS - An eleventh person was rescued from a Thai cave on Tuesday evening, a navy source and a provincial official told AFP, as the dramatic bid to free 12 youth footballers and their coach inched towards a successful end. It was earlier reported that divers have begun the third phase of the rescue of a youth soccer team trapped more than two weeks in a flooded cave in northern Thailand and aim to bring out the last four boys and their coach Tuesday, the top rescue official said. The eight boys brought out by divers over the previous two days are in "high spirits" and have strong immune systems because they are soccer players, a senior health official said. Doctors were being cautious because of the infection risk and were isolating the boys in the hospital. Chiang Rai Gov. Narongsak Osatanakorn said Tuesday's rescue operation began at 10.08 a.m. and involves 19 divers. A medic and three Thai Navy SEALs who have stayed with the boys on a small, dry shelf deep in the flooded cave will also come out, he said. "We expect that if there is no unusual condition ... the 4 boys, 1 coach, the doctor, and 3 SEALs who have been with the boys since the first day will will come out today," he told a press conference to loud cheering. The first eight boys rescued are in good mental and physical health and are asking for chocolate, officials said Tuesday, although two were on antibiotics after being tested for pneumonia. "Everyone is in a good mental state," Jesada Chokedamrongsuk, permanent secretary of the public health ministry, told reporters at Chiang Rai hospital. "None of the eight boys has fever today," he added in the clearest update yet on the condition of the boys rescued from Tham Luang cave. "They (all the boys) will have to stay in the hospital for one week to wait for their results and to see if anything changes," he said. "They're asking for chocolate. We can see that everything is ok as they're eating well," he said. Thailand has been riveted by the dramatic rescue mission to save the "Wild Boars" team after they first got trapped in Tham Luang more than two weeks ago by rising floodwaters.